When I first started out as a young woman, about the age of fourteen, I knew that because of my Neuromuscular Disorder, Spinal Muscular Atrophy, that I would never be able to have children. It was at this time, that a very inappropriate incident happened while I was an inpatient,on the paediatric floor of our local hospital. Thank the Lord, He spared me from what could have resulted in a life altering decision, that I would have made out of sheer ignorance. It sounds unbelievable but it happened, while I was admitted for back related surgery. I don't want to share all the sordid details, because they have no purpose. But, the story in general is part of a life changing lesson.... I came home believing I might be pregnant! Sharing my fears and the details with my closest cousin/friend. We kept it to ourselves during Christmas break. I didn't know what to do, except talk with her thankfully. It was far too scary to tell my parents. Filled with shame and the fear of the worst rejection, my mouth stayed shut. By the end of my two week Christmas vacation, my nerves let go and began shivering and quaking my insides. It was during their New Year's eve house party, as I was tucked up in bed, that I summoned my mom in tears. I had to say something. After all, I might be pregnant (or so I feared). As the tears rolled down my cheeks, she entered my bedroom and asked what was wrong....the words didn't come. All I could say over and over was, "It's the worst thing the world, it is the worst thing in the world..." Oddly enough, my Mom guessed immediately, what I was trying to say. The bottom line was, she said I would have to have an abortion if I was pregnant. I just agreed, it was all I knew to do. She didn't yell or anything like that, it was all so matter of fact. She said I had to tell my Dad! Terrified of making him hate me, I laid there shivering some more. He entered my room and she exited. And again, all I could say between sobs, was..."it's the worst thing in the world.... over and over" He didn't say it out loud, but it was clear to me that he also knew what I was talking about. Something tells me, they had discussed this before. He gently affirmed what my Mom said about what I would have to do, if I was with child. He left the room and both went back to their party. I must make sure that it is clear, that my parents do NOT approve of abortion at all. Back then, the belief was that pregnancy could kill me. Well, after Christmas break, I was brought back to my second home. It was a residential institution for children with disabilities where we could get physic and occupational therapy. And in my case, I could attend an accessible school. 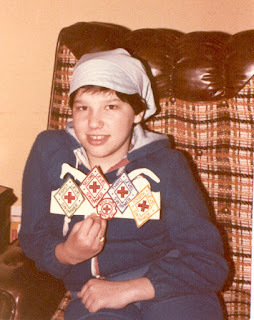 For some reasons I shared what happened with one of the Registered nurses at the time. Not because I was scared, but because back then, I was a desperate young lady, wanting to be loved and to love. For some reason, sharing something like this (even though the boy should have been arrested), with others, in my twisted mind was my way of letting people know that someone "loved" me. Well, this boy did not love me one bit. It was wrong and should not have happened. Another person was eavesdropping and called in my Mom, recommending that I be put on the birth control pill. My mom later told me that she said, "no, I think Anita, has learned her lesson." Dear Mom....thank you for your vote of confidence. was in the huge library there, lying on the huge board room style table was a single book. Maybe it was beside there, not so sure...all I know is it was the only book I remember seeing. Can't remember the title, but it was loaded with photographs and testimonies all about what abortion was. You see, up until that moment, even though I had agreed, I never knew what it meant to have an abortion. I just knew it meant I wouldn't be pregnant anymore. Not for one second, did I consider, how that pregnancy would end. Nor did I even consider that it would actually be murder....a choice, I would not have been able to undo. If you don't really know what happens in an abortion, I beg you please research the subject. If I didn't find out, the Lord only knows what would have happened to me. Once I knew it was wrong, I wouldn't of had one, even if it wold have killed me to be pregnant. I wasn't following the Lord at this point in my life, but I definitely now believe, He orchestrated that event. So I could work there (thanks to my Mom's help), and just "stumble" upon this powerful book! Needless to say, my fear of ever getting pregnant, kept me from making anymore wrong decisions that might result in pregnancy. In no way, did I ever want to risk that happening. So much so, I didn't even trust the birth control pill. That one or two percent chance, for me, was still too high. Unfortunately, I did make a huge, foolish decision a year or so later to have a tubal ligation. It was for all the wrong reasons and sadly, I wish I would have learned much sooner what real love was. But, all things happen for a reason and I know nothing is in vain. Here I am, alive and able to share what God did for me and does ever single moment. This woman I want to share below, also has an even more incredible story to share...Did you know there are those who have survived an abortion attempt on their lives? Gianna Jessen, is one of the most amazing ladies I have ever discovered on the internet. 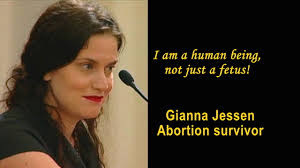 Until "meeting" Gianna, I never knew that there were adults in our world who actually survived a murder attempt on their life, in their mom's womb. Gianna's Mom went to an abortion clinic. The Doctor did the horrifying act of believing he was killing Gianna. Her wee teeny body was left on a shelf or some cold place like that and then miracles of miracles happened...God caused a nurse to intercept this tiny baby's life, struggling to survive. It has been a few years or more since we first watched her testimony, so I don't have all the exact details. But I remember the nurse brought her to a hospital to get medical care and Gianna survived! It was a true act of God as she blesses the lives of others, through being adopted and sharing her story and her passion for supporting the protection of ALL human life. If you have had an abortion, please know that if you confess your sins and repent, turning toward Jeus Christ, we all can find forgiveness. I could never be good enough. Jesus loves you. Without Him, I would not be here.